First Tennessee Bank and Capital Bank, members of the First Horizon National Corp. (NYSE:FHN) family of companies, today announced a five-year, $3.95 billion community benefit plan to increase access to financial resources within low- to moderate-income (LMI) communities in Florida, Georgia, Mississippi, North Carolina, South Carolina, Tennessee, Texas and Virginia. The community benefits plan, which is an agreement with the National Community Reinvestment Coalition (NCRC) and its community-based members across the Southeast, will run from 2018 to 2022. The plan includes mortgage and small business lending, community development lending and investments, philanthropy and spending with minority-owned suppliers and marketing firms. It also includes innovative methods to increase the convenience and physical access to financial services in low- to moderate-income communities. 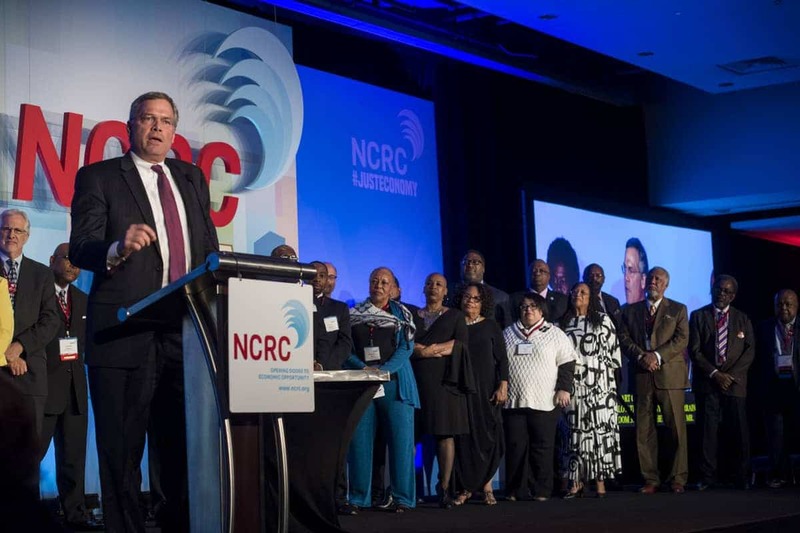 Bryan Jordan, chairman and CEO of First Horizon National Corp., surrounded by representatives of community groups, announces First Tennessee Bank’s Community Benefits Agreement with NCRC at NCRC’s Just Economy Conference April 9, 2018. Increasing home ownership: Fund $515 million in home purchase and rehabilitation mortgage lending. This will translate into approximately 967 new homes owned by people of color and 533 homes owned by low- or moderate-income people. Building small business: Fund $1.9 billion in small business lending to businesses in low-to-moderate areas and businesses with less than $1 million in annual revenue. Strengthening communities: Fund $40 million in grants and philanthropy, including supporting workforce development, small business, housing counseling, Community Development Corporations (CDC), Community Development Financial Institutions (CDFI), and funding financial literacy and education programs for children, young adults and small business entrepreneurs. Supporting supplier diversity: Devote 3%-6% of the bank’s supplier spending to minority-owned businesses. “Considering the very significant needs of this region and First Tennessee’s markets, this agreement and the investments in it are a great down payment on meeting those needs,” said Irvin Henderson, Chairman, National Trust Community Investment Corporation. “The Community Reinvestment Alliance of South Florida was very pleased to participate in this process with NCRC and First Tennessee. We look forward to working together to continue improving our community,” said Cornell Crews Jr., Executive Director, Community Reinvestment Alliance of South Florida. “First Tennessee in good faith has developed a community benefits plan that is meaningful and impactful. Reinvestment Partners looks forward to working with the bank as a leader in North Carolina,” said Peter Skillern, Executive Director, Reinvestment Partners. “HEED looks forward to working with First Tennessee on creating neighborhoods of choice and a just economy in their Mississippi markets,” said Charles Harris, Executive Director, Housing Education & Economic Development. “The Memphis Housing Authority is excited to support the First Tennessee Community Benefit Plan. The population we serve in Memphis are by definition low-income households who have not always had the ability to benefit from a true banking relationship. The Memphis Housing Authority feels this plan will provide them access to services that will build their self-sufficiency, independence from government assistance and improve their future,” said Marcia Lewis, Executive Director, Memphis Housing Authority. “SMASH is pleased to see that First Tennessee has agreed to a CBA that will strengthen investment in low-income communities of color. We look forward to working with them to make sure that this capital is used for equitable development, not gentrification” said Adrian Madriz, Project Lead, SMASH Inc.
“I’m delighted about the commitments made by First Tennessee Bank. Incremental progress that addresses the divide between business community reinvestment and consumer needs is essential for the recovery of all economies. Durham Regional Financial Center looks forward to the social and economic benefits made available to our residents, businesses and minority institutions in Durham and surrounding counties,” said Glyndola Massenburg-Beasley, President Durham Regional Financial Center. “After working with the National Community Reinvestment Coalition (NCRC) to produce a publicly accessible bank lending disparities report for our city, Chattanooga Organized for Action is delighted to see these concrete steps and partnership agreed to by First Tennessee. This is the first Community Benefits Agreement that applies to the Chattanooga area, and we hope it becomes a model of development and investment as our city grows. NCRC’s expertise has been invaluable, and they’ve helped grassroots organizations like ours learn how to be included in the process of community reinvestment,” said Michael Gilliland, Board Chair, Chattanooga Organized for Action, Inc.
“First Tennessee Bank has been a staunch supporter for many years of Operation HOPE’s efforts to provide financial dignity and empowerment to all people. Senior executives have also donated their time to work with us side-by-side. CEO Bryan Jordan has become a member of our executive board of directors, Vice President Steve Swain is a member of our advisory board of directors, and Senior Vice President, David Fehrenbacher has joined our midwestern board of directors. Now, with this nearly $4 billion commitment to helping the underserved, First Tennessee is taking it to the next level,” said John Hope Bryant, CEO and Founder, Operation HOPE. Chattanooga Organized for Action, Inc.
Real Estate Education And Community Housing Inc- R.E.A.C.H.